This switch got a favorable comment from Joseph Bernard at Clemson on the netgurus mail list. Sold by fs.com. Think fiber supply. It appears that fs.com is a distributor and not and OEM or ODM. So this switch is made by someone else. 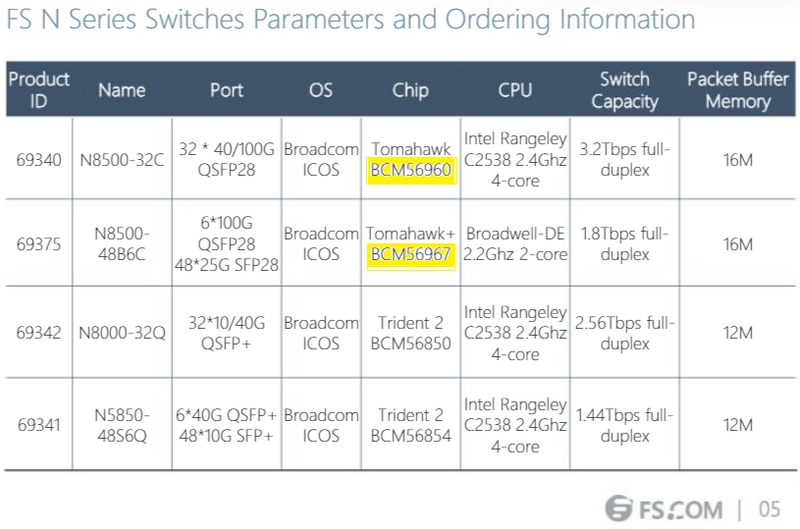 There is a data sheet but if you zoom in on the center of the top of the switch photo it says Redstone D2060. So, when it was time to produce the data sheet in October 2017 no suitable picture was available. An older switch was tapped to stand in for the beauty shot. There is also a catalog page which gives the web price. n.b. Check the vendor's web page and do not rely on this snapshot for current price. This appears to be an Agema (Delta) AG5648v1. N8500-48B6C is a Top-of-Rack (TOR) or Leaf switch in a compact 1U form factor, ideally suited for high performance and programmable data center environments. 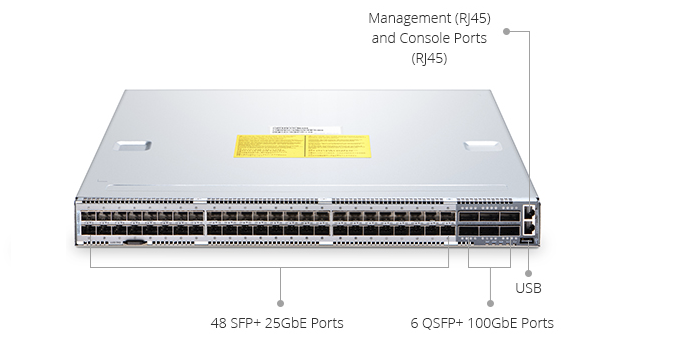 The N8500-48B6C provides 48-port 25GbE SFP28 and 6-port 100GbE QSFP28. It delivers excellent low latency and power efficiency in a PHYless design, while offering high reliability features such as redundant and hot swappable power supplies and fans in forward and reverse airflow configurations. With support for advanced features, including MLAG, VxLAN, SFLOW, SNMP, MPLS etc, this switch is ideal for traditional or fully virtualized data center. The N8500-48B6C supports current and future data center requirements, including an x86-based control plane for easier integration of automation tools, an ONIE installer for 3rd party network operating systems and compatibility with Software Defined Networks via OpenFlow 1.3.11. Additionally, N8500-48B6C supports the advanced hardware based VXLAN feature to support over 16M virtual networks.